According to the Milwaukee Journal Sentinel, today marks the first day of official closing operations for the BMO Harris Bradley Center. Forty-five full-time and 606 part-time employees are officially out of work today (the new Fiserv Forum will add 600 full- and part-time jobs when it begins operations, however). Closing operations are expected to be completed by September 7. After that, the once-mighty Bradley Center will go the way of Sydney Hih, the Y-Not III, and (more or less) the Grand Avenue mall. It’s entering its final days. So why not watch an ’80s-tastic special from when the Bradley Center was entering its first days? 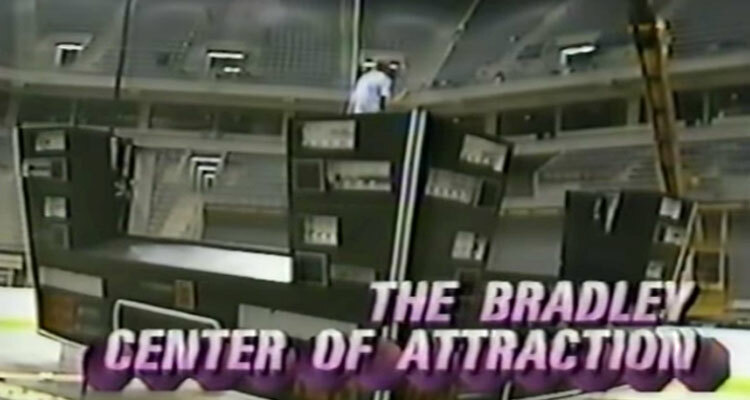 From September 25, 1988—less than one week before opening day—News 4’s “The Bradley Center Of Attraction” gives Milwaukee an exclusive behind-the-scenes peek at its spiffy new gift. Frightfully fresh-faced hosts Mike Gousha and Mike Jacobs call the new complex “a great arena for sports and entertainment,” “a great source of pride for everybody in southeast Wisconsin,” and just generally gush over the thing. It’s bittersweet considering how it was deemed a hunk of junk less than three decades later.